Yes, it is here! Probably the most controversial Ubuntu release since EVER hit the servers, as planned, on the 28th of April. Canonical is, if nothing else, to be admired for the courage of sticking to their original plan and pushing their ideas forward, despite all the unrest they caused. On the other hand, this courage is a bit diluted by the fact that the GNOME project has also undergone a major makeover so users are now pretty much stuck between these two. 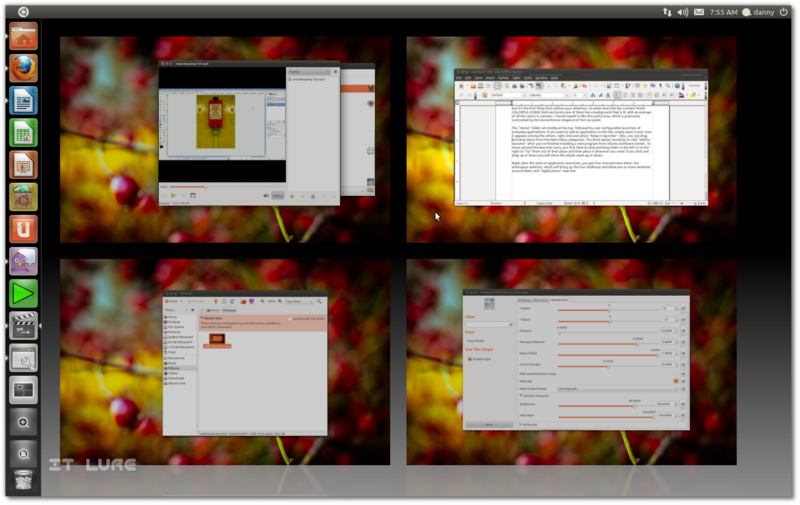 A much riskier move would've been for Canonical to release the Unity-powered desktop well before the GNOME 3 release. On the other other hand, the community has every right to be pissed at the company for ignoring their gripes. I am now out of hands so we'll move along, please follow. Ubuntu 11.04 – Natty Narwhal – as flashy as it is, still weighs under 700 MBs, so right after you download the ISO from one of the myriad servers worldwide, you can throw it on a CD. 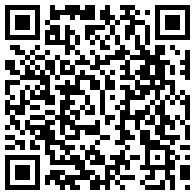 Or save the optical disc trees and use the faster alternative: USB flash drive + unetbootin. The live environment boots and the first question that pops up is if you want to head straight to the installation or stroll around carelessly, checking out the new Ubuntu experience (beware though, the “new” experience won't be exactly new, as the Unity interface will load only after installation (at least when it comes to NVIDIA GPUs)). I always like to look inside the Examples folder to see what the developers put in there, but this time I was disappointed... the same two files as six months ago – 1 audio .ogg and 1 video .ogg. But, I still love Josh Woodward's Swansong, so I am not THAT upset. 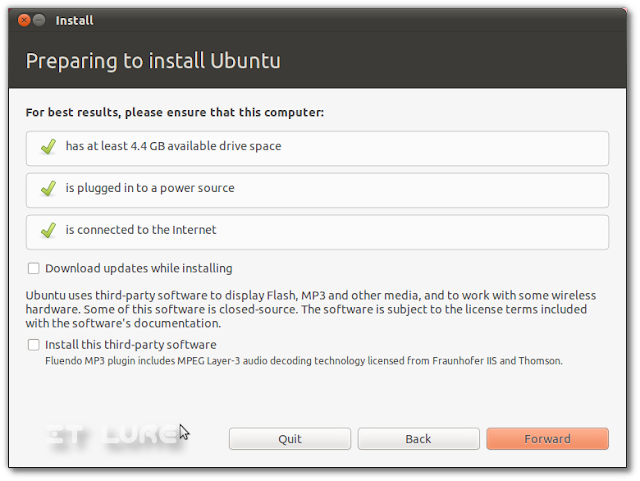 Double clicking that glorious “Install Ubuntu 11.04” icon opens up, wait for it... the Install window! The language is very important, so that's why selecting the one that applies to you is the first step. A checklist of 5 items is shown next, out of which three are automatically “greened” if you meet the following conditions: at least 4.4 Gbs of available drive space, active Internet connection and electrical current straight from the power grid. The next two checkboxes are left empty: Download updates while installing and Install this third party software. If you don't care about 100% open sourceness and want your stuff to work, I suggest clicking on that last checkbox. Third step, and probably most important one, drive space allocation. UUUUU, shivers down your spine! There are now three scenarios to choose from, complete with weird icons: “Install Ubuntu alongside them”, “Erase disk and install Ubuntu” and “Something else”. The last one brings you to the partition manager from where you can mess around with your filesystems. 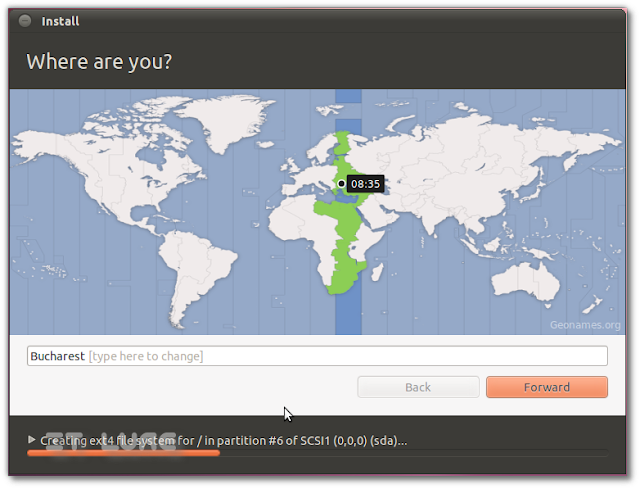 If an Internet connection is found, Ubuntu will detect your location all by itself in step numero quatro. If not, you can go ahead and embarrass yourself by failing to find your country in less than two clicks. 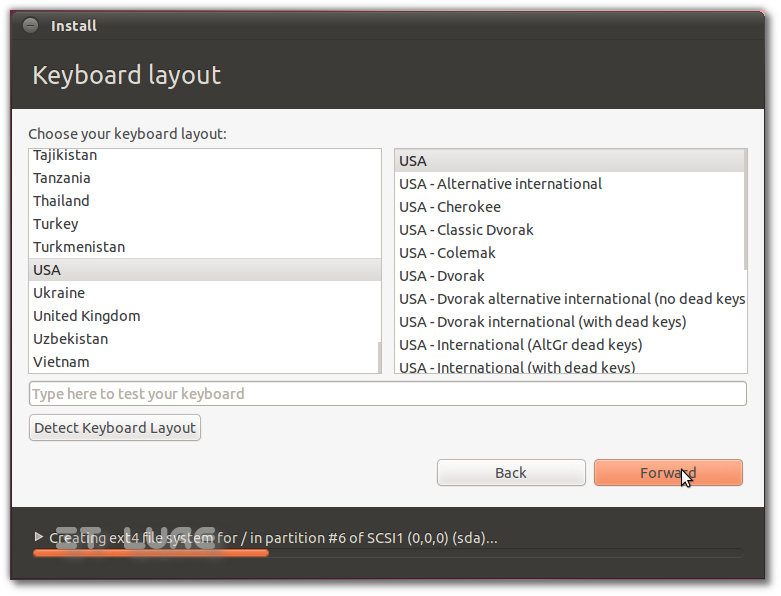 The keyboard layout is next on the line and also the point where you can select Uzbekistan while installing the OS for a friend and make them hate Linux forever. Well done, jerk! The final question can be a bit tricky for some, depending on the hour and alcohol intake levels: “Who are you?”. Username, computer name, password and encryption are the fields to be filled and the boxes to be checked. If the “Who are you?” question was a tough roadblock to go through, look on the bright side: by the time you managed to figure it out, the installation was probably already finished! In the background! Wizardry! Aaah, so you can now finally boot into Natty Narwhal and get stabbed in the eye by its horn, aka Unity. Actually, it's not that bad... With today's screens more wide than tall, there's plenty of room to spare on the side, so you'll come to appreciate the extra cm of space you get by not having a bottom panel. Oh, of course Unity is not only about a thicker panel on the side rather than on the bottom, but it's the first thing that catches your attention. So what does this bar contain? HUGE COLORFUL ICONS! Each and every one of them has a background that is lit with an average of all the colors it contains. I found myself to like this joyful area, which is graciously contrasted by the monochrome elegance of the top panel. The “Home” folder sits boldly at the top, followed by user configurable launchers of everyday applications. If you want to add an application to the list, simply open it and, once it appears among the others, right click and select “Keep in launcher”. Also, you can drag and drop items from the Main Menu categories. 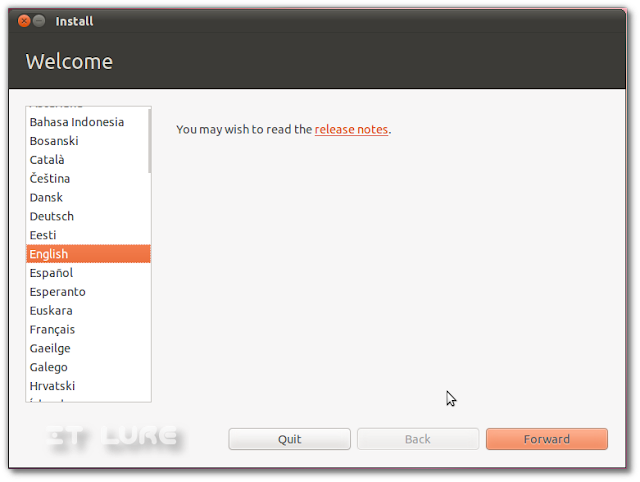 The third option would be to click “Add to launcher” after you've finished installing a new program from Ubuntu Software Center. To move around the launcher icons, you first have to click and drag them to the left or to the right to “rip” them out of their place and then place it wherever you need. If you click and drag up or down you will move the whole stack up or down. 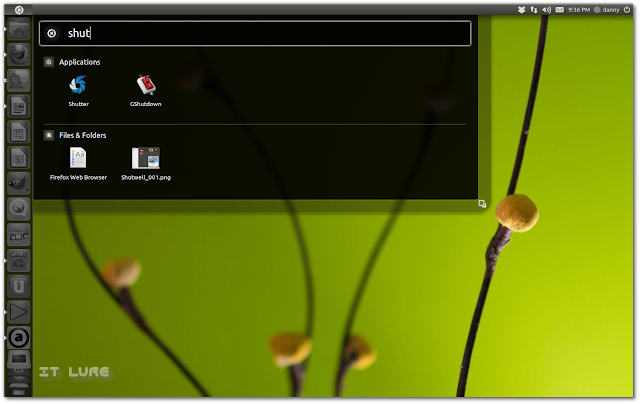 Right after the suite of application launchers, you get several monochrome items: the workspace switcher, which will bring up the four desktops and allow you to move windows around them, the separate “Applications” and “Files & Folders” searchers, the mounted drives in your computer and the Trash. As the launcher bar gets more and more crowded, the last few items will shrink so that they can all fit and allow you to locate the needed items at a glance. When you hover your pointer over them, they will expand back and push the top items upwards. While this is a valid solution, I would've loved to have the option of making ALL the items smaller. So how do you know if a particular program is open? Its icon on the launcher bar will display a small arrow on the left side. Once you bring it in focus, another arrow will appear on the right side this time. Having more than one instance of the same app (like 2 Firefox windows or two LibreOffice documents) transforms the left arrow into a corresponding number of small round lights. To switch between these instances, simply click the icon and the “Scale” plugin will bring both up so you can choose. Or, obviously, you can use ALT+TAB – which, sadly, isn't as snappy as I want it to be. Clicking the Ubuntu logo at the top left corner brings up a dashboard with the initial focus placed inside an universal search field that instantly returns results, as you type. This feature alone saved Unity from my wrath, as trying to get to a certain application is rather tedious without it. 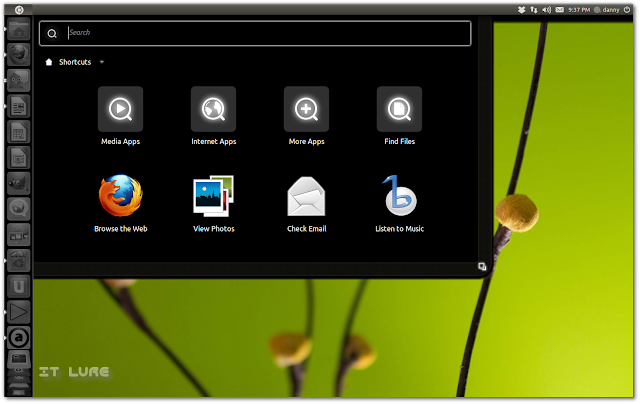 The dashboard shows 4 categories – Media Apps, Internet Apps, More Apps, Find Files - and another 4 activities that are supposed to be used on a daily basis: Browse the Web with Firefox 4.0.1, View Photos with Shotwell, Check Email with Evolution, Listen to Music in Banshee. Let's say you want to open up gedit, without using the search feature. 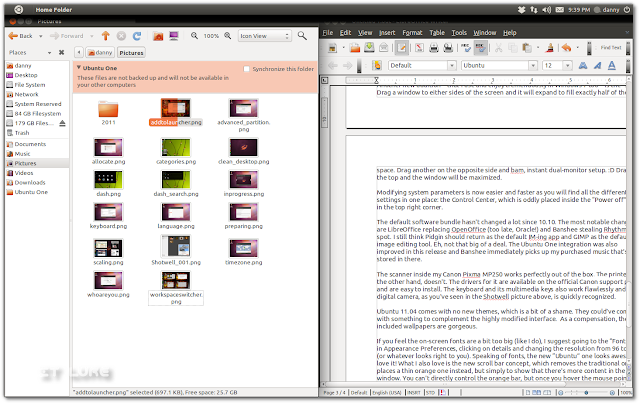 Click the Ubuntu logo , go to More Apps, select Accessories from the right side of the dash, then click on “See x more results” in the Installed section and only then you can finally see the text editor. Quite a few steps, right? But! If you use gedit a lot, it will appear in the “Most Frequently Used” pane, thus skipping 1 click. A quicker way is to right click the “Applications” icon in the Unity bar and go straight to the area you need. A feature that I do like is the “Apps available for Download” which displays 6 recommended programs for the category you are browsing at that moment; a great way to discover new programs without visiting the Software Center. What I am still struggling to get used to is the dreaded GlobalMenu. I think I actually hate it. Why do I have to navigate aaaaall the way to the top to reach the menu of a gedit window that sits on the bottom? Oh well, it does save some screen space, but still, I'd rather have the Application X menu attached to the Application X. Another new addition – that I use and enjoy tremendously in Windows 7 too – is the “snap”. Drag a window to either sides of the screen and it will expand to fill exactly half of the space. Drag another on the opposite side and bam, instant dual-monitor setup. :D Drag to the top and the window will be maximized. Modifying system parameters is now easier and faster as you will find all the different settings in one place: the Control Center, which is oddly placed inside the “Power off” menu in the top right corner. The default software bundle hasn't changed a lot since 10.10. The most notable changes are LibreOffice replacing OpenOffice (too late, Oracle!) and Banshee stealing Rhythmbox's spot. 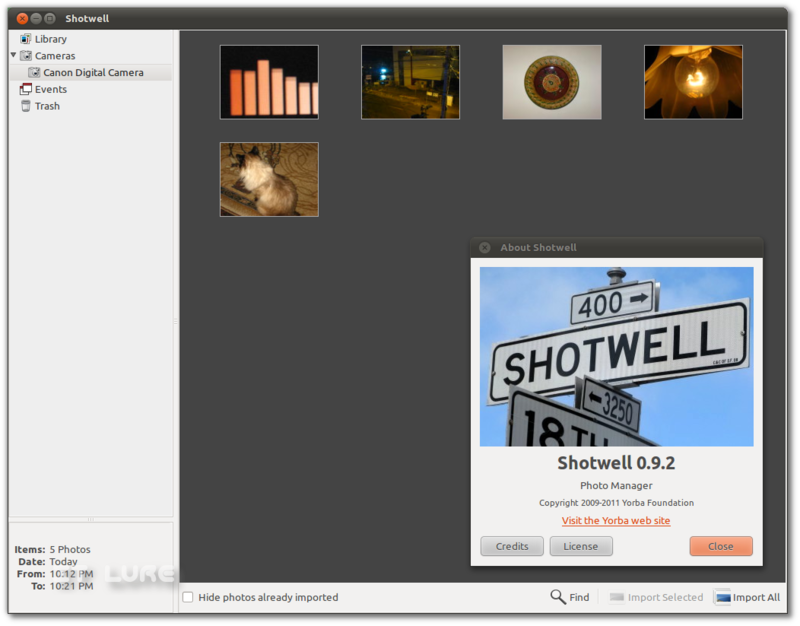 I still think Pidgin should return as the default IM-ing app and GIMP as the default image editing tool. Eh, not that big of a deal. The Ubuntu One integration was also improved in this release and Banshee immediately picks up my purchased music that's stored in there. The scanner inside my Canon Pixma MP250 works perfectly out of the box. The printer, on the other hand, doesn't. The drivers for it are available on the official Canon support page and are easy to install. The keyboard and its multimedia keys also work flawlessly and the digital camera is quickly recognized. 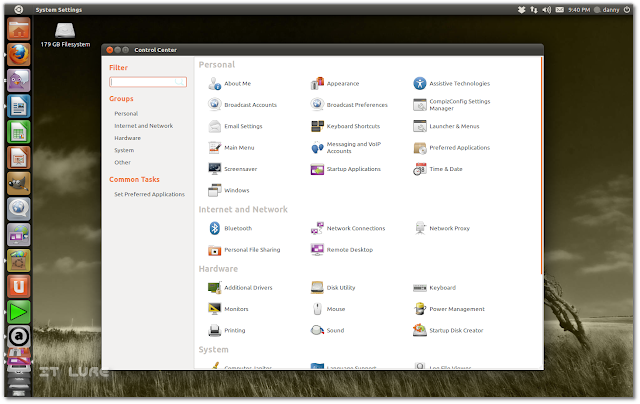 Ubuntu 11.04 comes with no new themes, which is a bit of a shame. They could've come up with something to complement the highly modified interface. As a compensation, the included wallpapers are gorgeous. If you feel the on-screen fonts are a bit too big (like I do), I suggest going to the “Fonts” tab in Appearance Preferences, clicking on details and changing the resolution from 96 to 89 (or whatever looks right to you). 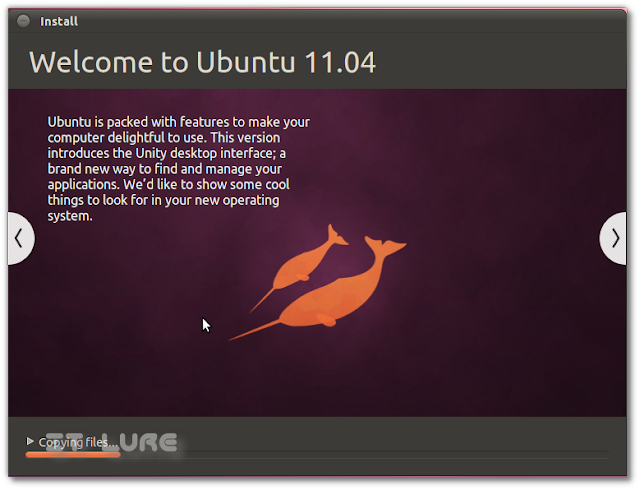 Speaking of fonts, the new “Ubuntu” one looks awesome. I love it! What I also love is the new scroll bar concept, which removes the traditional one and places a thin orange one instead, but simply to show that there's more content in the window. 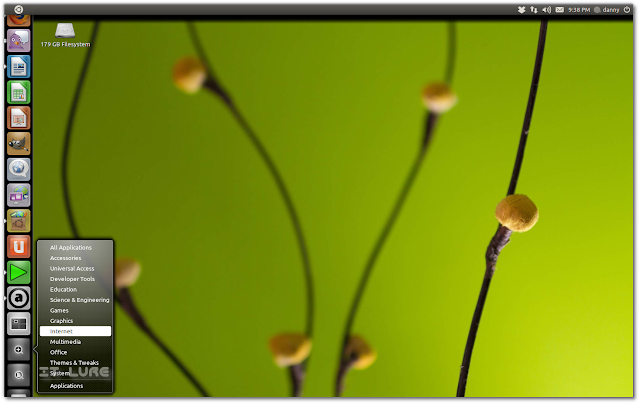 You can't directly control the orange bar, but once you hover the mouse pointer over it, a “scroller” will appear just outside the window and allow you to move up or down. Smooth! With all that being said, Unity still feels like a Beta release. I encountered flickering, randomly-appearing jerkiness when moving windows around (I can't put my finger on what's causing this), the messaging icon getting stuck, poor response from the Unity dash and other minor quirks. Other than that, I am pleased to report that no major problems are pulling 11.04 down. Oh, to get the best of Unity, I suggest learning at least a few keyboard shortcuts. They will make your life better, trust me! I really would've liked to see Canonical push out Unity in 11.10 or even 12.04, giving it more time to mature. If you ask me, adding it as a non-default option at the login screen would have been the best for Natty, making everyone happy. But, as buggy as it can get, the overall experience is not disastrous and I bet flocks of new users will peek in, just to see what's all the fuss about. And once they are lured, it will be hard for them to deny Ubuntu's and GNU/Linux's qualities we all fell in love with. You can reduce the size of the icons in the unity bar by installing compizconfig-settings-manager(ccsm). After installing, then open system settings/ccsm/ubuntu unity plugin/experimental/launcher icon size. For me it works to have the icons at 34 instead of 40. O, thanks a lot! 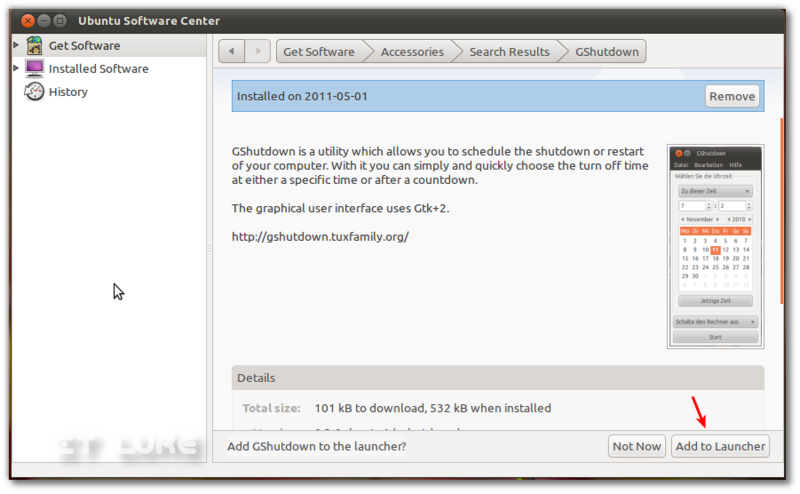 :) I do have ccsm installed, but somehow I missed the option. Yes adjusting down the size of the icons is a must. Remove blur effect from dash and it will become more responsive. "I encountered flickering, randomly-appearing jerkiness when moving windows around (I can't put my finger on what's causing this)"
That would be the wonderful Linux 3D graphics drivers at work. Ubuntu made a huge mistake by making Unity depend on 3D graphics out of the box. Ubuntu 11.04 desktop is a real mind-blower and mind divider in Linux world, even being called "Unity". Have a look at comments on my blog: there are 70-30 between those who likes and dislikes. The Unity desktop would improve immensely if it adopted the same look as 10.04 Netbook edition, ie that the desktop theme is visible behind the LHS icons, Hope this simple improvement can be implemented. Searching in the dashboard is the new feature that I am finding most useful. It can be much faster than navigating a tree... if you know what to search for (those unknown unknowns are tougher to find). The overall Unity concept is fantastic. But like any new technology it must mature. In a short period of time this will be the style of interface that is more recognized by the general public then anything else. There will be improvements made along the way. A person should remember that these 6 month releases are testbeds for the LTS versions. Thanks for the time you took to write this review. You can use CCSM to auto-hide the dock, too -- it's under "Desktop" in the settings for "Unity Plug-in." Once I found out that bit of information, I've become far less negative about Unity. 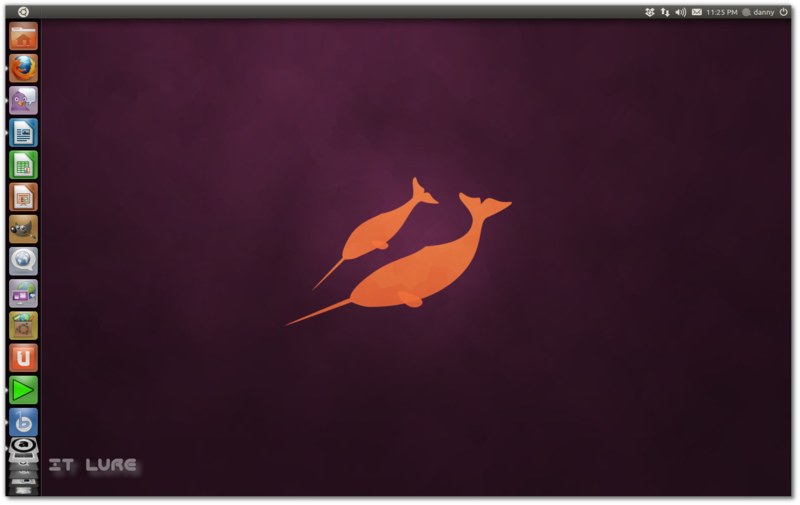 I've been an Ubuntu user since 2005 and have been a Gnome fan just as long. I wasn't thrilled with Unity at 1st but it has definitely grown on me. 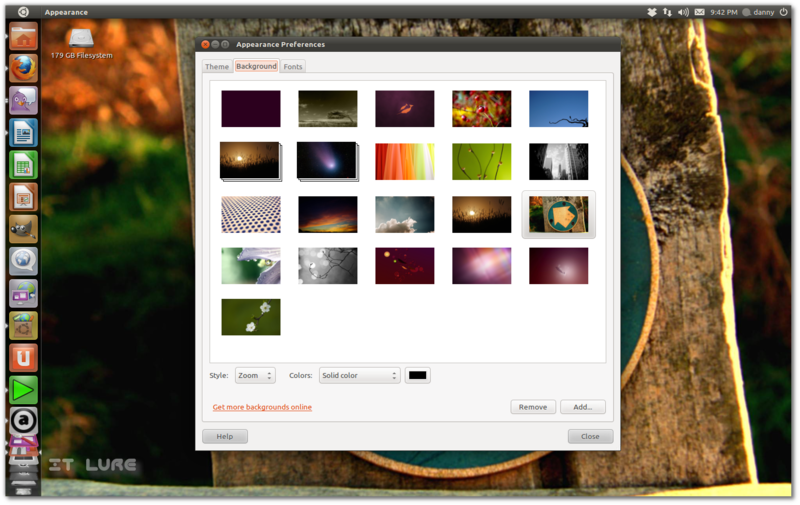 I hope the Ubuntu team sticks with it and works hard to fix the few bugs that Unity introduced. Hm. I *LIKE* the Unity interface. It shines especially when you make use of the keyboard shortcuts. But sadly I will have to move to something else; it's just too buggy. I've been running Ubuntu for years and years on a very standard Lenovo Thinkpad (NVidia gfx) and currenlty too much stuff just stopped working. * Getting an external display to work is getting MORE difficult, not easier. This caused many freezes and issues, and I can't get the Unity dock to display on the left most screen. So 11.04 seems more like a very early alpha than an actual release. Sure I could stick to the long-term supported version, but I don't want to go that long between updates.. I completely agree with the article's summary: keeping Unity for 11.10 or 12.04 would have been much better, or make it an 'experimental' feature. It's really too bad, because I love the interface. But it's just not ready. 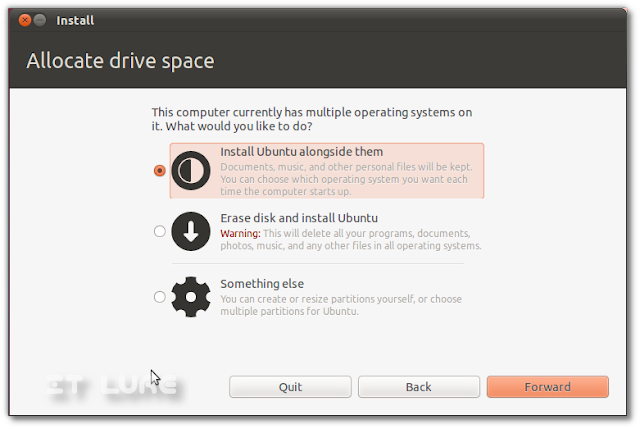 Ubuntu/Canonical is actually a lot worse than Microsoft ever was in terms of throwing stuff over the wall that's really not ready for prime time.